Come feel the aloha spirit with SoBe Surf in the Cocoa Beach Area, Florida. 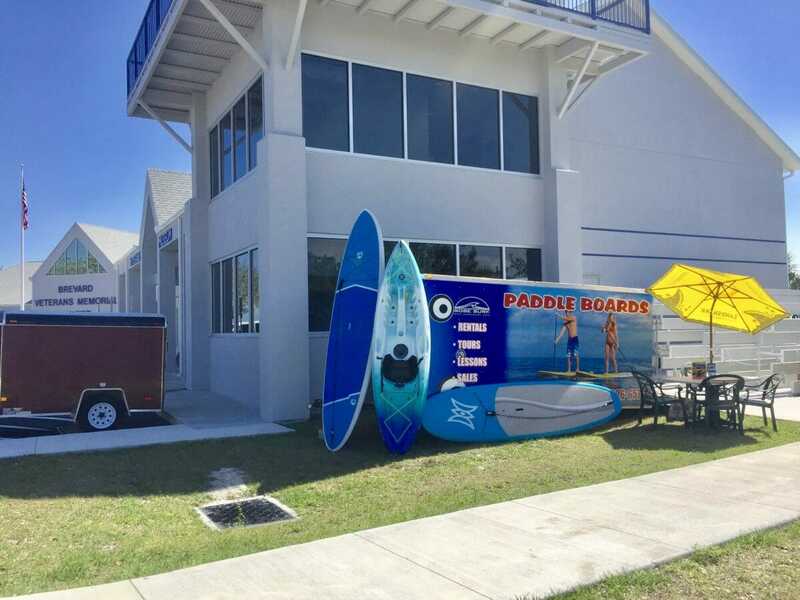 Our shop is located in the heart of Merritt Island, with exclusive quiet water access at the beautiful Veteran’s Memorial Park located at 400 S. Sykes Creek Rd, Merritt Island, Fl 32952. Just park and paddle, then visit the amazing Veteran’s Museum where our luxury high-seat-back kayak rentals & tours begin and end. See dolphins, manatees, fish, and other wildlife in the Banana River Aquatic Preserve and nature sanctuary. Read below for more info and BOOK ONLINE, or ring us anytime at 321-926-6571! 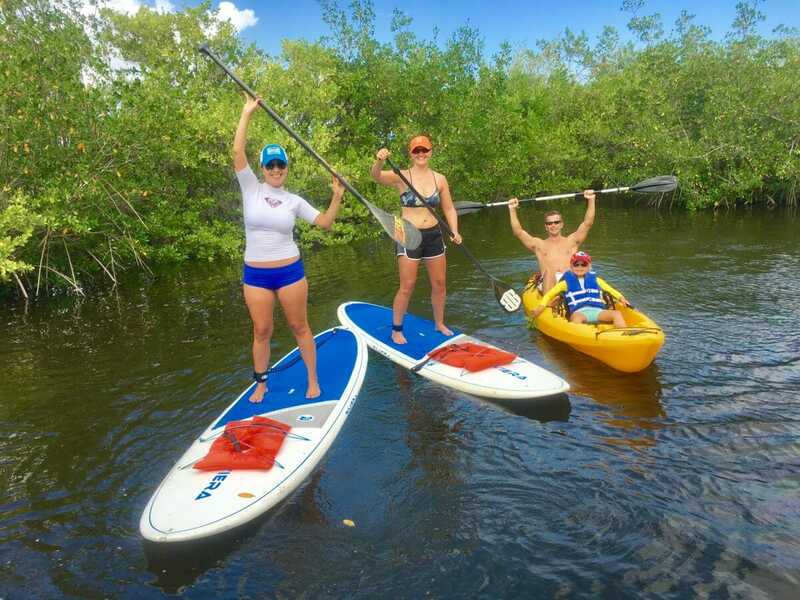 SoBe Surf is a full-service kayak rental and stand up paddle rental shop and tour service. We’re located in the heart of Merritt Island, Florida, and easy to get to from Orlando, Daytona Beach, and Disney World. We are minutes from Cocoa Beach and the Kennedy Space Center, with exclusive, quiet water access at the Veteran’s Memorial Park located at 400 S. Sykes Creek Rd, Merritt Island, Fl 32952. 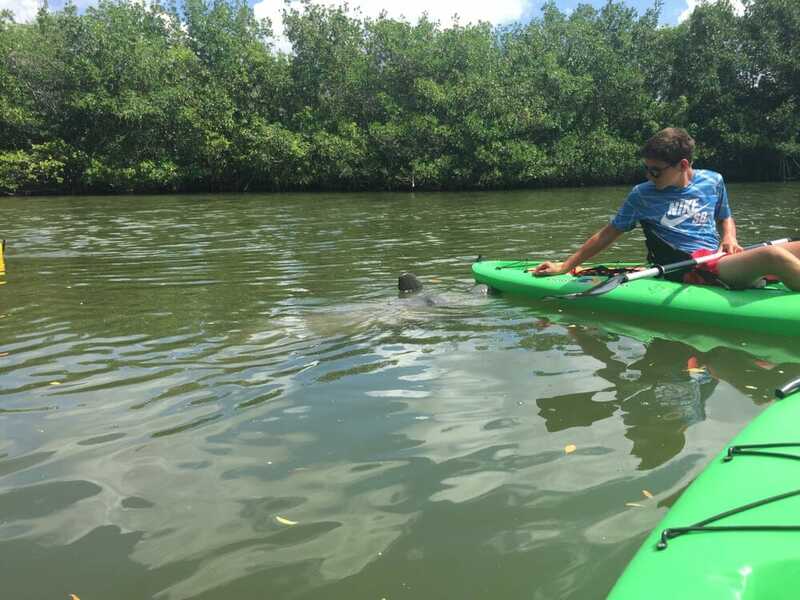 Just park and paddle into the Banana River Aquatic Preserve where dolphins and manatees reside, then visit the amazing Veteran’s Museum!! You will appreciate the quality and integrity of our service and the amazing location that provides access to! Explore some awesome natural settings with private access to the Banana River Aquatic Preserve. Visitors commonly get visits from dolphins and manatees, as well as schools of fish and sea birds. You could hardly ask for more in such an easy to access location! Our Luxury High Seat Back Kayaks are a comfortable, easy and safe way to access some great places on the water. Whether it’s flatwater touring, fitness or a little of both, you’ll be in position to have a great time. Complimentary briefing on technique and equipment use. Click on the “Book Now” button (below) to reserve your kayak rental online. You’ll be all set to go when you get here! To schedule and reserve, simply book online using the booking button on this page and you’ll be all set to go. 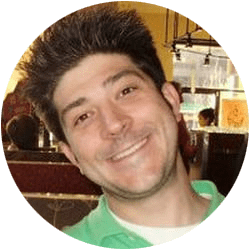 If you have any questions, feel free to call us at (321) 926-6571 and we’ll be glad to help you out! “After spending a few days at Walt Disney World last week we moved over to Cocoa Beach for some relaxing in the sun. Most of the days were spent relaxing around the pool or playing at the beach. 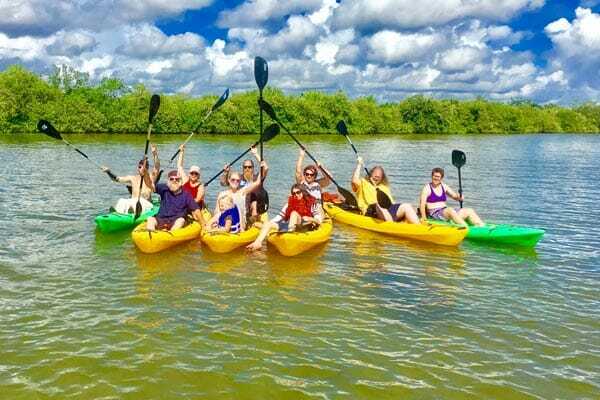 We did drive up to Port Canaveral to watch the SpaceX rocket launch, but that was the extent of our excitement until the last day, when a few of us rented kayaks from SoBe Surf and explored Sykes Creek. “Rather than taking a guided tour we decided just to rent the kayaks and go out exploring on our own. We met up with one of the SoBe employees at their shop and then followed him in our car out to the launching pad, less than a half mile down the road. We were given our equipment and some suggestions on where we could find some wildlife. 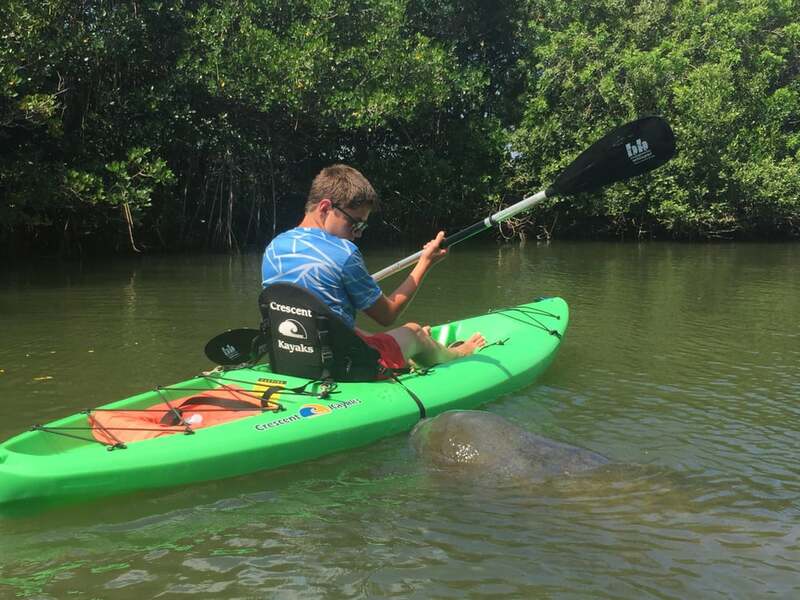 “Once we paddled out to Sykes Creek from the launch we decided to head about 300 yards south to a little cove where we were told manatees liked to hang out. We paddled all the way to the back of the cove before without seeing more than a few birds, but as we began to paddle back out toward the main creek we were surrounded by manatees! “The giant sea cows were very slow-moving and gentle, though one of them found Nick’s kayak to be very interesting. He even went belly up to get his mouth fully on the bottom of the kayak. Immediately I was mad at myself for not bringing my GoPro as I would love to have seen what they were doing under the murky water. 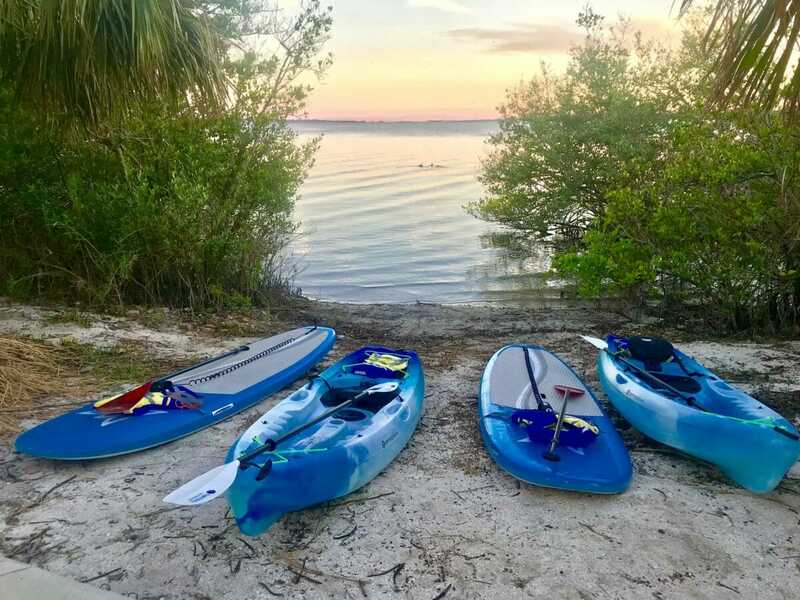 “We spent a good amount of time in the southern cove before paddling north to a larger cove that didn’t seem to have any manatees in it. We continued north to the Merritt Island Causeway bridge, where we spotted a dolphin. We tried to follow it as it continued north but we quickly lost track. On our way back toward the launch, we found a dolphin who was busying trying to catch a meal along the shore wall. 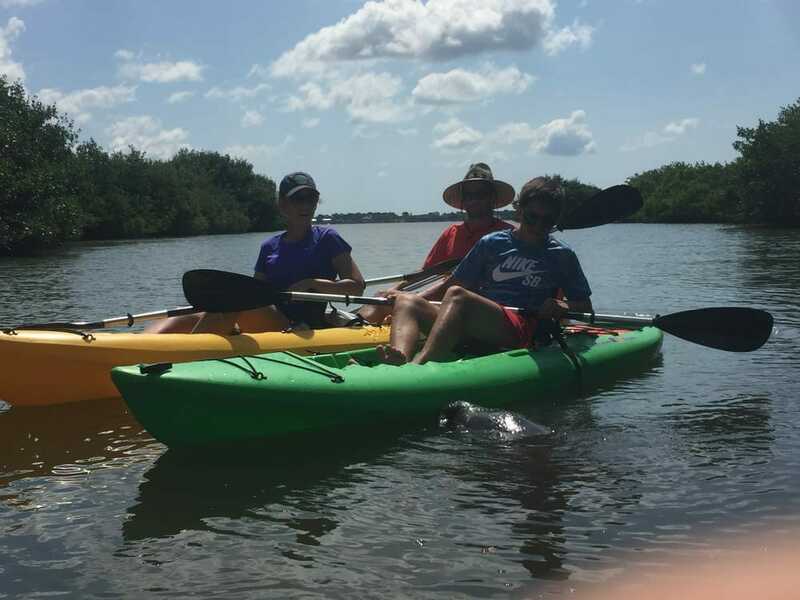 Looking for a guided kayak nature tour near Merritt Island? Look into our kayak eco tours. In addition to great equipment to use, you’ll get the benefit of an experienced professional guide to take you to some of the best places to see wildlife and other highlights in the area!